Cook and stir peppers and onions in large nonstick skillet sprayed with cooking spray on medium heat 5 min. 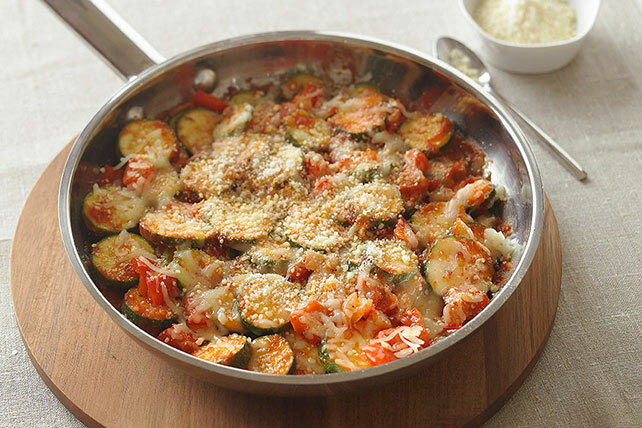 Add zucchini; cook and stir 2 min. Stir in pasta sauce; cover. Cook 8 min. or until vegetables are crisp-tender, stirring occasionally. Sprinkle with cheeses; cook, covered, 1 min. or until mozzarella is melted. Top each serving with 1 Tbsp. chopped fresh basil or parsley.